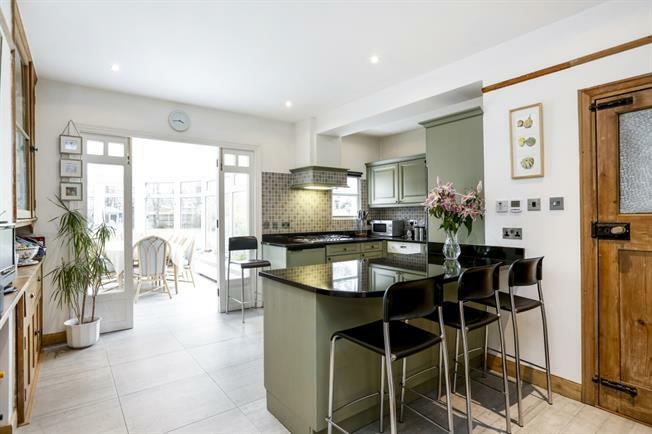 4 Bedroom Detached House To Rent in London for £5,200 per Calendar Month (Calculated). SHORT LET - ALL BILLS INCLUDED This delightful family house offers light and airy accommodation ideal for short lets. On the ground floor the spacious entrance hall opens onto two good size reception rooms and the modern kitchen/breakfast room with integrated appliances. There is a large sunny conservatory opening onto the garden with a utility room and guest WC completing the accommodation. The first floor offers three excellent double bedrooms and a contemporary family bathroom with whirlpool bath and separate shower. On the top floor is another double bedroom with en suite shower room, plus a spacious study area. The house is set back from the road in the heart of the Merton Park Conservation Area close to John Innes Park. Merton Park is a quiet residential area, close to Wimbledon town centre, which offers excellent access to transport including rail, tube, bus and tram and to the A3 for road travel. There is ample off street parking to the front of the property and a large well-maintained rear garden with paved terrace area, lawn and flower beds.